Hi, The virgin engineer set up the TV box in our new house using the existing coax cable that my electrician had installed previously. The virgin engineer did not comment or informed me on whether the existing coax cable was no good and that I needed to use a virgin coax cable. Will the coax cable provided by my electrician work as well as a virgin coax cable ? can you view TV using the cable? if yes, then it's working. I have not connected it yet to a TV. I just wanted to know before I did so as I was told that they are not similar. In fact what I need is to replace the connector the VM engineer used by an F connector module but was told by the module supplier that VM use different F connectors to the standard ones on the market since the VM coax cable was different from the standard coax cable. the grade virgin use is a bit higher than your usual stuff, but the engineer should have checked it was all working before leaving. are you sure to coax cable the electrician installed isn't for your outside aerial? When the VM engineer came to connect the TV box to the coax cable, I already had fitted to the wall a socket with a combined TV aerial and a coax point. The VM engineer removed the socket I had installed and replaced it with a standard VM wall box. The VM engineer having replaced my TV aerial and coax socket by the VM box, I no longer have an aerial point, which I need. And I told him so. He told me that the coax point I had was no good for VM because VM use an F connector not an ordinary coax connector. So I need to know if I got a combined TV aerial and an ordinary F connector socket (a satellite F connector) to replace the VM box, would the ordinary F connector work ? actually coax IS coax. i did specify that grades vary though. a coax cable is still coax cable regardless if it is high or low grade cable. 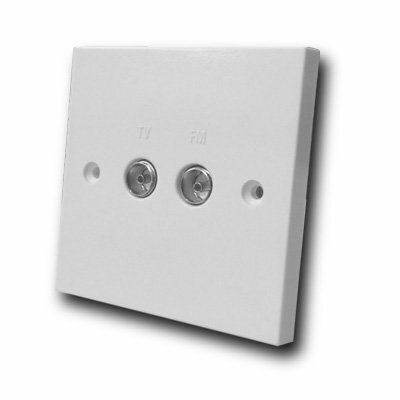 Firstly, the VM coax outlet houses a safety isolator. This will not fit in a standard wall box. Secondly, there also may be issues with housing a rooftop aerial outlet & a VM outlet in the same box. Freeview TV & Cable TV use similar, sometimes conflicting frequencies, that may cause interference to leak onto the local network. I'm not clear what you installed in first place from what you posted, was it a co-ax cable from that socket to where? As you have a std. co-ax outlet and a "F" connection which was your co-ax connected to? Or maybe you had two co-ax cables. With an arrangement like shown one would expect one to be to a terrestrial aerial and the other to a satellite dish. If VM being installed I would have expected the VM installation to be completely separate installation. I had installed a cable to go to a terrestrial tv aerial and a coax for VM, both ending on the same dual socket at one end. The coax cable goes to the VM TV box at one end inside the house. The other end of that cable goes to a splitter that connects to the main cable coming into the housse from the external VM main box. I am thinking now that I need to leave the VM box as it has been installed by the VM engineer and connect the TV aerial cable to another socket separate from the original dual socket. It will certainly be simpler.